A large part of the Financial Coordinator’s job is to work directly with insurance companies, knowing how to work with them, how to get the best estimates possible and then how to follow up to make sure the office receives payment. This – can be a complex process at the best of times. The Dental Financial Coordinator serves a vital role in the front office team and dental practice because this position ensures the doctor and office get paid! 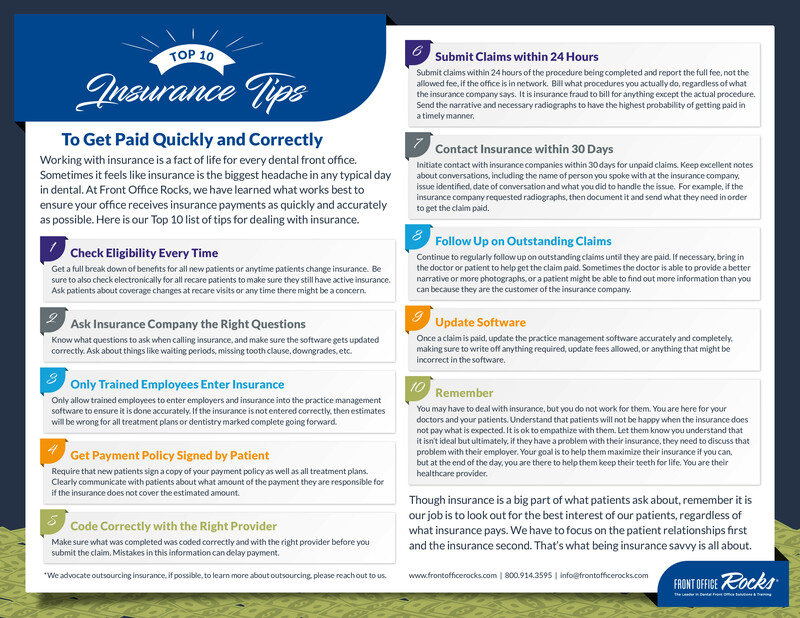 Our Top 10 Insurance Tips For Getting Paid Quickly and Correctly Infographic provides your dental team with a list of our TOP tips for dealing with insurance. Read on to find out more and download your copy. 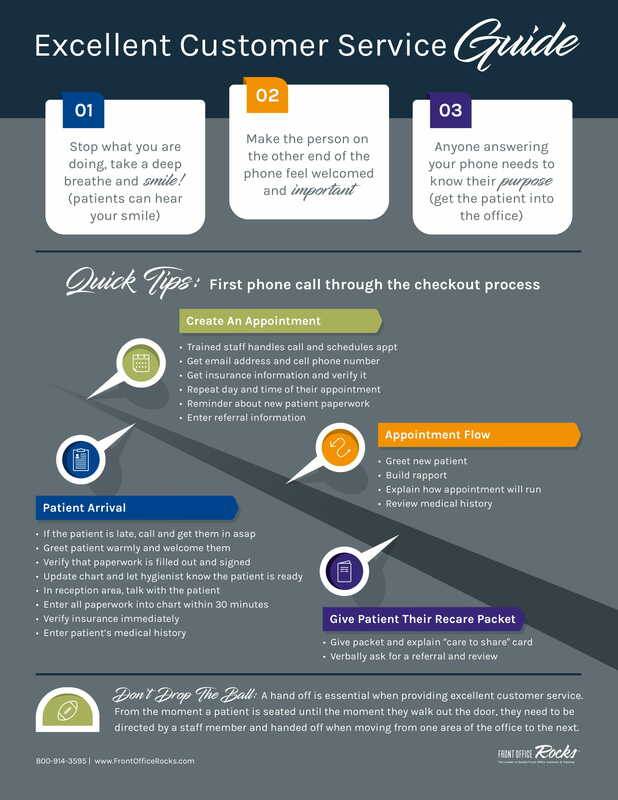 This infographic has been created to provide your dental team with a quick reference guide of ways to ensure your office receives insurance payments as quickly and accurately as possible! Our TOP 10 Insurance Tips! 10. Remember: You may have to deal with insurance, but you do not work for them. You are here for your doctors and patients. Because we send so many claims daily, it becomes rather easy for a few to fall through the cracks. Most insurance companies accept electronic claims, which are typically returned to us within two weeks. However, some insurance companies only accept paper claims, which can take much longer to be returned. Whether the claim was sent by mail or electronically, it is important to track the status of claims over 30 days old. Visit our resources document, Calling on Outstanding Insurance to find a detailed policy and to learn more about managing outstanding insurance calls! This is not about being insurance driven, just the opposite, it is about learning to manage insurance and help patients find the best way to pay for the dental care they need. Love it or hate it, insurance is something that everyone in the dental industry has to deal with on a regular basis. To serve our patients well, it’s vital for us to understand the ins and outs of insurance, including the details of what’s covered and not covered by specific plans. This list is a good starting point of reference to help your dental team in learning how to deal with insurance and most importantly, how to get your practice paid quickly and correctly!